It's the facelifted second-generation Nissan Qashqai, which has undergone small but numerous changes in order to strengthen its appeal in the ever-busier compact crossover market. 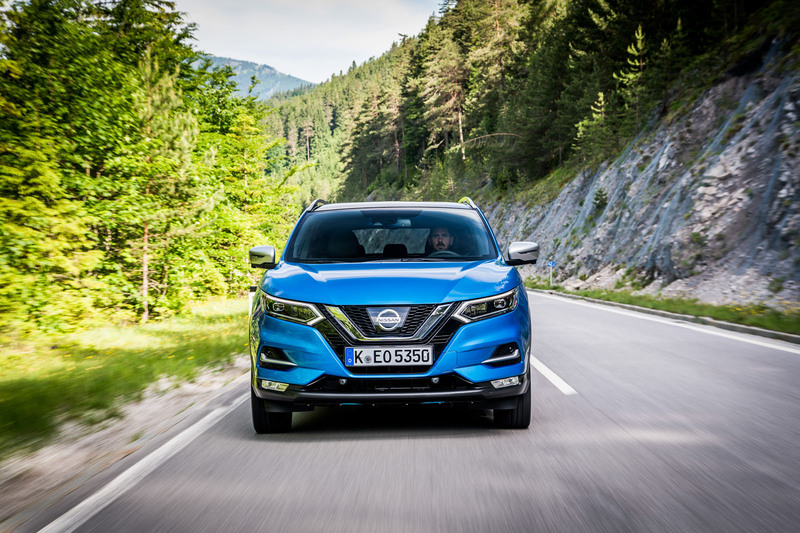 It's not as if sales are flagging, though: in 2016, Nissan sold almost twice as many Qashqais in Europe as it did following the pioneering original's launch in 2007, and remarkably, the Qashqai is the UK's third best-selling car since the start of the year. But Nissan says its customers want more plushness, be it in terms of design, finish, equipment or refinement, so changes have been made to the exterior styling, cabin materials, sound deadening, suspension and steering. All models now get DAB radio as standard and there's a new range-topping trim, Tekna+, whose main attractions are patterned nappa leather upholstery and an eight-speaker Bose sound system, plus satin-finished roof rails and a huge panoramic glass roof that are both inherited from the now-deleted N-Vision trim. The previously conservative-looking front end has been embellished with a more intricate and aggressive nose design, revised lights (now with adaptive LED headlights on upper trims) and sharper bonnet creases, while the flanks and rear end have been lightly smartened. Inside, there's a new flat-bottomed steering wheel that's larger and has more buttons than before to allow easier operation of the binnacle's 5.0in TFT screen and cruise control - it's thinly padded but attractive and ergonomically pleasing. New seats on the upper trim levels impress by being supportive and accommodating, and the aforementioned nappa hide looks the part and is reasonably soft. Tekna+ also introduces electric lumbar support and memory function for the driver's seat - both unique among Nissans in Europe - on top of the existing electric seat adjustment and heating on Tekna models, although steering reach and rake remain manual. For the rest of the cabin, it's largely as you were: up front there are plentiful soft-touch surfaces above waist height, a commanding and roundly adjustable driving position and mostly satisfactory switchgear. In the more austerely finished rear, there's well-lit and unencumbered accommodation for two six-foot adults (a third would be less happy), and a reasonably proportioned boot behind 60/40-splitting rear seats with a multi-configurable floor and handy storage features. The Qashqai has always erred on the side of comfort, while offering reasonably capable if somewhat unexciting dynamics when pushed. The latest changes aim to amplify this relaxed mien, with springs softened between 5% and 8% (depending on kerb weight), although a front anti-roll bar stiffened by 16% aims to preserve cornering composure. There's even a newly enhanced version of Active Ride Control, which uses gentle braking via both the discs and the engine to dissipate large bumps such as sleeping policemen more rapidly (handy when you're late on the school run), while additional refinement-enhancing measures such as extra sound-deadening material, better seals and drag-reducing underside fins all help curb wind and road noise to rarified levels. Turn-in remains decent for a crossover, but the significant amount of roll - while never inhibiting stability - puts the kybosh on cornering enjoyment. Rather, the Qashqai feels an ambivalent partner when tackling bends at pace, and defaults to understeer a fair bit sooner than a family hatchback might. The revised steering is subject to a little stiction and felt over-light to these hands in Normal mode, but its 10%-heavier Sport mode helped on both counts, with good mid-corner consistency and plenty of accuracy. The unaltered 161bhp 1.6 DIG-T petrol needs to be stoked to 2800rpm before providing good shove, but thereafter does so consistently, smoothly and without much lag. It's only available with the six-speed manual gearbox that doesn't mind being hustled, but could feel a bit more precise. We also sampled the 128bhp 1.6 dCi diesel, which proved a bit vocal despite being freshly retuned for refinement, and was paired with the 'Xtronic' transmission that does a good a job as any CVT in mimicking a conventional auto. The more affable (and more popular) 108bhp 1.5 dCi - good for 99g/km of CO2 - and sedate but well-mannered, entry-level 113bhp 1.2 DIG-T carry over completely unchanged. New Tekna+ trim adds some welcome niceties, but the Qashqai’s underlying material quality prevents it mixing with more thoroughly premium alternatives such as the larger VW Tiguan or swisher Audi Q3 that can be had reasonably well specced for similar money. The Qashqai's increased emphasis on comfort over fun will surely do its already strong sales no harm, although those of us who enjoy an everyday dose of handling talent might be increasingly tempted to look to the likes of the Seat Ateca, the fresh-faced rival that now seems even better value as Qashqai prices rise by at least £300. Skoda's upcoming Karoq will provide yet more competition, not least because of its superior space and flexibility. But the Qashqai's rounded, fit-for-purpose appeal remains strong following its mid-life refresh. Still no Spotify, Android Auto or Apple Car Play though. Come on Nissan, you need to get better connected. Ike your rivals. Besides that though, looks good. The word "compact" in reference to crossovers and SUVs, indeed modern cars in general, is looking as inappropriate now as it's use by the American car industry in the 70s. Emm an Q3 with Nappa, electric seats, panaoramic sunroof, eight-speaker Bose, Adaptive LED lights would be well over £27,450, in fact the Q3 STARTS at £200 MORE, so the statement "..can be had reasonably well specced for similar money" is an alternative fact! Many reviews have slated the 1.2 Turbo as being inflexible. Surely with the target market using the car for lots or urban trips and the move away from diesel, working on a better petrol range should have been a priority. Since when has Toyota been a VW company? Looks like KITT needs to reboot and update. the spec table at the bottom is wrong. It states diesel with 161bhp. You drove the petrol and a 128 bhp diesel did you not? Glad to see the suspension being softened still further, despite the original being praised for its good ride - other manufacturers please take note! One hopes Nissan might try and make build quality standard this time compared with the hit and miss levels found on the first generation. Not talking about new tech or software,often an issue on other cars,but basic stuff like rattles-air vents,squeaks-steering wheel bushing and clunks-drivers seat base. Oh,and the air con is playing up again for the second time in a year. Autocar like to laud the QQ as some sort of automotive second coming but the in service reality for plenty of owners is rather less wonderful.